Other Republicans, notably including presumptive GOP nominee Mitt Romney, are more circumspect. For example, when asked in a GOP primary debate on September 22, 2011 if he believes that President Obama is a socialist, Governor Romney responded that he thinks that Obama is "a big-spending liberal, and he takes his political inspiration from Europe and from the Socialist Democrats in Europe" (see the YouTube video of the response here), but he declined to explicitly label President Obama as a socialist. Big-spending liberal? Socialist? Communist? European Social Democrat? Is there a substantive difference between all these labels that get tossed around so frequently in our current campaign season? More importantly, do any of them accurately characterize President Obama or the modern Democratic Party? Since the end of the Cold War and the success of the Third Way in England, "socialism" in Europe has essentially meant liberal democratic free-market capitalism (i.e. the exact same type of political system we enjoy in the United States) combined with a slightly more expansive welfare state and a "mixed economy," which is state ownership and management of a few select sectors of the economy deemed to be in the public good (transportation, utilities, telecommunications, etc.). In other words, the only remaining "socialism" in today's world (popular in France, Germany, and much of Europe) rejects 95 percent of the values and ideas that classical "socialist" philosophy is based on and has accepted free-market capitalism as the only stable and reliable means of generating wealth in society. To repeat, "socialism" today means free-market liberal capitalism + bigger welfare state + "mixed economy." Does this characterize the modern Democratic Party? Let's take the first one: do Democrats support free-market capitalism? Yes. And so do Republicans. Second, most European democracies spend somewhere between 20-30 percent of their GDP on welfare state services. The United States currently spends about 17 percent of our GDP on our welfare state. There's been no serious attempt by the Democrats to grow our welfare state spending by 10 percent of our GDP. Third, what about a "mixed economy"? Is President Obama advocating that the U.S. government take over the airline industry or the nation's Internet service providers? Is he advocating that the government seize the public airways, cell phone companies, or Internet service providers? No. What about Obamacare? Wasn't that "socialist" to the core? The ACA health care reform bill essentially did three things: 1) restricted freedoms of private insurance companies, forcing them to provide coverage for pre-existing conditions, among other things, 2) increased regulation of these private insurance companies, forcing them to compete in health care exchanges in an effort to lower costs, and 3) mandated that individuals purchase health insurance. None of these actions transferred ownership of the health insurance industry from private firms to the federal government, so there was no new "mixed economy," and therefore no new "socialism." Also, let's not forget that the United States has for some decades owned and operated health insurance programs. They're called Medicare and Medicaid. Even the most ardent opponents of health care reform are hesitant to label Medicare/Medicaid as "socialist." Now how about the economic stimulus package and the auto/banking bailout packages? After all, the government basically used tax-payer money to save Wall Street and Detroit from bankruptcy. In other words, the government took ownership of some of these private firms. That can indeed be classified as "mixed economy," certainly suggesting socialism. However, there was an important difference between the auto/banking bailouts and European social democracy. Unlike in Europe where this is designed to be a permanent fixture of the economy, the bailouts were temporary measures, designed to end as soon as possible. And the companies are well on their way to paying back these government loans (see here). Also, it's important (and ironic) to remember that these "socialist" measures were first advocated and set into motion by Republican President Bush a few months before Obama's inauguration. So if accusations of socialism are going to fly, let's remember that Republican President Bush would be the original socialist in this case. More often these days, however, the charge is made that increased government regulation is, by definition, socialism (or even communism). This is especially common amongst some politicians as of late. (See here, here, and here.) This is simply inaccurate. PolitiFact even rated the "Obama is a socialist" charge as a "pants-on-fire" mischaracterization. Increased government regulation of private firms and individuals, with higher taxation rates to pay for them, is more accurately described as modern political liberalism. This is not socialism; it's modern liberalism. Do President Obama and the Democratic Party prefer an increase of government regulation of private firms and individuals in an effort, as they see it, to protect Americans from poverty, illness, and unemployment? Certainly. That's modern liberalism. That was FDR's New Deal and LBJ's Great Society. And that's what President Obama has tried to do with health care reform, with the Dodd-Frank financial reform bill, and a host of other policies. It's politically liberal to be sure, but it's not socialism. The important thing to notice is where the red changes to green on the spectrum. 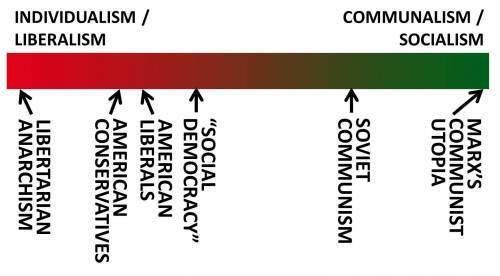 Take special note that all "mainstream" ideologies in the world today (American conservatives, American liberals, and social democracy), are all on the individualist end of the spectrum. The great irony is that, in the grand scheme of things, there's not much "socialist" about European social democracy anymore, and there hasn't been for the better part of the last two decades. So is it accurate for Republicans to characterize the Democratic Party and President Obama as socialists? No. They're liberals. (And if you don't like liberalism -- and that's okay! -- then being a "liberal" is certainly a bad thing.) Are they, at least, "more in the socialist direction"? Sure, just as much as Republicans are "more in the fascist direction" or "more in the anarchist" direction. It's entirely fair to call President Obama a liberal. It's even fair to call him a "big spending" liberal (assuming you're willing to call our previous president a "big spending conservative"). It is inaccurate, though, and a little disingenuous to call him a socialist. Liberalism and socialism are not the same thing.